A forward who signed from Rossendale United, Wythenshawe based Colin quickly became a star at Ewen Fields and will be fondly remembered for his five goals in an 8-0 FA Cup win against Colwyn Bay. He was about to receive a call up to the England Semi-Pro side with Ged Kimmins but Dario Gradi paid £50,000 to take him to Crewe Alexandra. This is the highest fee received by Hyde for a player. He had a long career at Gresty Road and included in his 193 appearances for Crewe was a Man of the Match performance at Wembley. 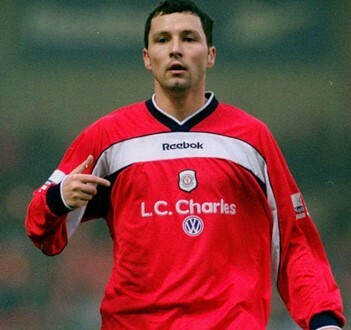 He scored 33 times for Crewe before moving on loan to Mansfield Town where he made 5 appearances. Next up was Macclesfield Town (34 apps, 7 gls) and then Halifax Town (8 apps, 2 gls). He then became a pivitol player for Altrincham, leading them to promotion in his first season and helping to keep them in the conference the following year.